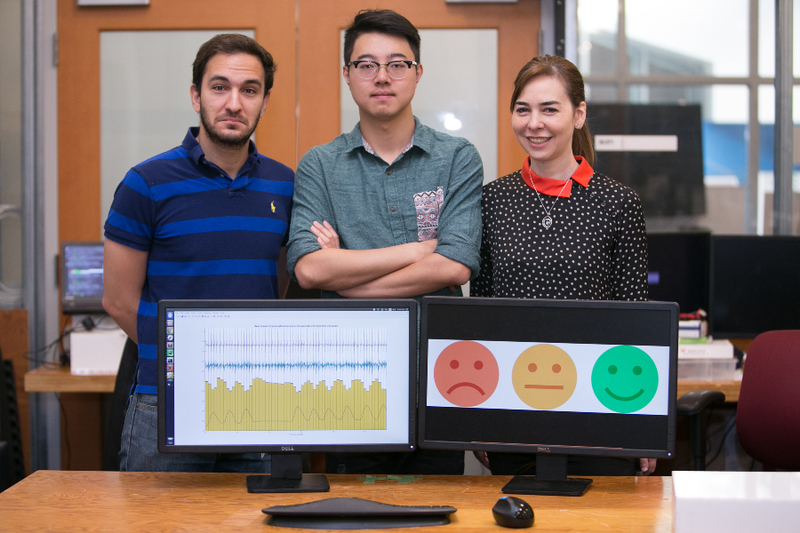 By measuring subtle changes in breathing and heart rhythms, EQ-Radio is 87 percent accurate at detecting if a person is excited, happy, angry or sad – and can do so without on-body sensors or facial-recognition software. MIT professor and project lead Dina Katabi envisions the system being used in entertainment, consumer behavior and health-care. Film studios and ad agencies could test viewers’ reactions in real-time, while smart homes could use information about your mood to adjust the heating or suggest that you get some fresh air. EQ-Radio builds on Katabi’s continued efforts to use wireless to measure human behavior like breathing and falling. She says that she will incorporate emotion-detection into her spin-off company Emerald, which makes a device that is aimed at detecting and predicting falls among the elderly. Existing emotion-detection methods rely on audiovisual cues or on-body sensors, but there are downsides to both techniques. Cues like facial expressions are famously unreliable, while on-body sensors like chest bands and ECG monitors are inconvenient to wear and become inaccurate if they change position over time. “Just by generally knowing what human heartbeats look like in different emotional states, we can look at a random person’s heartbeat and reliably detect their emotions,” says Zhao. Compared to Microsoft’s vision-based “Emotion API”, which focuses on facial expressions, EQ-Radio was found to be significantly more accurate in detecting joy, sadness and anger. The two systems performed similarly with neutral emotions, since a face’s absence of emotion is generally easier to detect than its presence. One of the CSAIL team’s toughest challenges was to tune out irrelevant data. In order to get the heart-rate, for example, the team had to dampen the breathing, since the distance that a person’s chest moves from breathing is much greater than the distance that their heart moves to beat. To do so, the team focused on wireless signals that are based on acceleration rather than distance traveled, since the rise and fall of the chest with each breath tends to be much more consistent – and therefore have a lower acceleration – than the motion of the heartbeat.